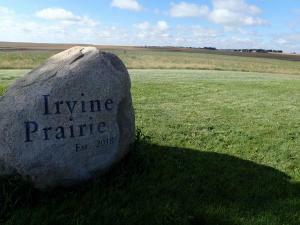 Irvine Prairie is a 77-acre prairie-in-progress on the farm of Cathy Irvine in memory of her husband David. 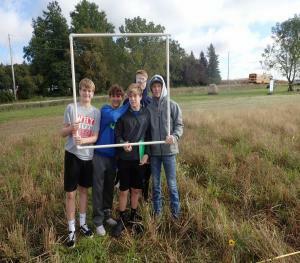 In partnership with Cathy and the farm operator, we will restore and maintain an ecologically diverse tallgrass prairie that engages current and future generations of students and community members in learning about Iowa’s prairie heritage and appreciating the benefits provided by prairie. The Iowa Natural Heritage Foundation holds the conservation easement on the property, and the University of Northern Iowa Foundation Properties Corporation is the owner. The site was dedicated on May 18, 2018. The UNI Alumni Magazine ran a story with photos in their Spring 2019 issue. Over a period of five years we anticipate planting about 100 species of native prairie plants, using the most genetically diverse and regionally appropriate seed sources available, and closely matching species with soil moisture conditions. Some hard-to-establish species will be started in our greenhouse and introduced as plugs. The Tallgrass Prairie Center will use the best known approaches to controlling weeds and encouraging diverse, native wildlife. We are committed to documenting the work, and carefully monitoring the results, to guide future management decisions. Irvine Prairie will be a place for the community and kids of all ages to learn about Iowa's prairie heritage. Watch this space for more information. Irvine Prairie is free and open to the public. Facilities are limited at the moment, but we encourage and welcome visitors to explore the planted areas. No hunting or motor vehicles are permitted. 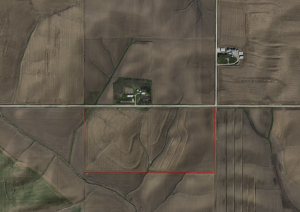 To find Irvine Prairie, navigate to 1173 55th Street, Dysart, Iowa. The driveway on the north is a private drive; please do not use. Park on the south side of the road in the grass, near the stone marker. For more information, contact Laura.L.Jackson@uni.edu.